Since one of my resolutions pertains to reading more books, I’ve decided to create a new section on this site based on the choices I make. This way, when I reflect on the stories I’ve read, I’ll have some retainment of the stories to see my growth. As a kid, I hated writing book reports because they were always about stories I didn’t want to read. I’m someone who naturally has the knack for writing, so I didn’t mind the actual writing portion of them, but I always thought I’d love writing them more if I was allowed to write about the things I wanted to read. My current GoodReads list of books to read is nearly 30 deep and there’s a ton of varying topics. 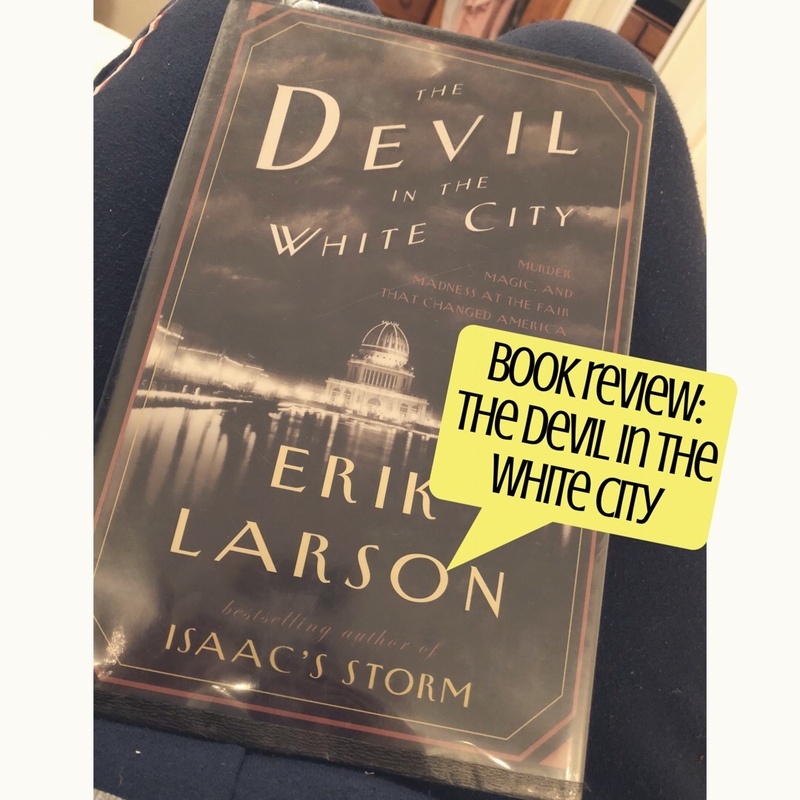 I usually find recommendations on sites like theSkimm or Thrillist, which is where I found the first book of my reading challenge: The Devil in the White City by Erik Larson. What makes this story so interesting is that it takes place during the 1893 World’s Fair in Chicago: It tells the trials and tribulations of fair planner Daniel Burnham and his team faced while creating one of the largest World’s Fair to put Chicago on the map as a legitimate city, living in the shadow of previous successful fairs like in Paris. During the same time, cunning pharmacist H.H. Holmes used the allure of the Fair to capture his victims, which were young women and formed himself into what we would call a modern day serial killer, taking notes from the iconic Jack the Ripper. Because it’s so long ago, it gives the allure of it almost not being a real thing that happened in our own history. I actually did some research about the Fair because it didn’t seem like it was a real story with how Larson wrote it. Even though Larson had a way of telling history with a new and interesting spin, it was still very dry reading material. At times, I felt myself struggling to get through a chapter because I would get lost in the stage setting of the Fair. I was more interested in how Holmes became the serial killer that he was, but rather it felt as if it was a small connection made. It seemed like it was more along the lines of ‘oh hey, by the way, while all this frustration of trying to put Chicago on the map as a world city is going on, some guy is killing people’. I wish that Larson took more time to paint the picture of Holmes, but I understand that not much was known about how or why he did his gruesome acts. The way that Larson concluded the story of Holmes seemed so rushed and almost forgotten about while he was writing the other aspect of the story. To me, it seemed like there was so much attention to detail about the World’s Fair and that the correlation of the Holmes’ killing spree was something to tie in, but poorly executed. Understanding that there simply wasn’t that much documentation about it, it’s hard to make up something that happen and assume what could have been Holmes’ intention. With that said, it should have been completely omitted then or written as an entirely different story. There was no need to force the correlation. Since I don’t have any real interest in learning about architecture or design, I struggled to get through the sections about Burnham and his woes. However, it was very interesting to see how a lot of the masterminds of some iconic buildings we know today, like the Flatiron Building or Central Park in New York, were all brought in to create something as magnificent as the World’s Fair. I think I struggled most with trying to wrap my head around the fact that this happened 125 years ago and the level of technology back then to now is so drastic that it’s almost hard to fathom how they did it, which definitely deserves some appreciation. It’s not to say I hated this book, but to me it fell incredibly short of my expectation, though I didn’t know what my expectation was going in. I think I was looking more about the killings rather than the petty fighting that happened between laborers. This entry was posted in book reviews and tagged #blogger, architecture, ​ bloggers, bbloggers, beauty blog, blog chat, blogger girl, blogger life, blogger lovin, blogger style, blogging, blogging gals, blogging tips, book review, chicago, erik larson, fashion blog, fbloggers, history, life with sarah, lifestyle blog, murder, on the blog, sarah lokker, sarahhlokk, savvy blogging, serial killer, the devil in the white city, world's fair. Bookmark the permalink.